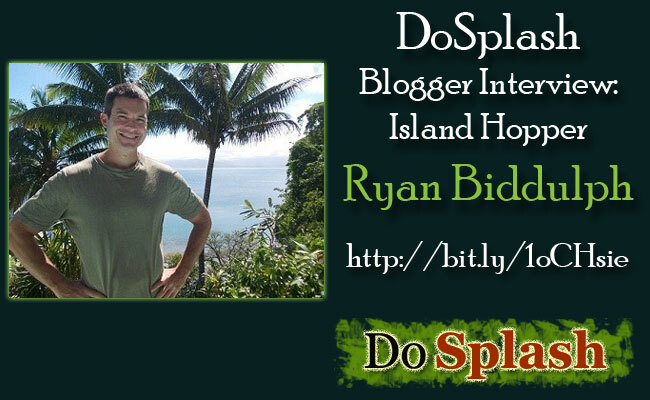 I am VERY happy and excited about this week’s interview as we have the cool island hopper Ryan sharing hist tips/views with the DoSplash community. If you are on to something online, I’m sure you’d have noticed Ryan’s cool pictures with some island as the background 🙂 He is a non-stop island hopper and a non-stop blogger. So I’m pretty sure all of us will learn useful stuff from his experience since he is able to lead a fun-filled life and run a business on the go! Ryan, you most probably don’t need any introduction in the blogosphere. But just for the sake of starting this interview, could you please introduce yourself to the DoSplash community? My name is Ryan Biddulph. I’m an author, blogger, freelance writer and internet lifestyle junkie who owns Blogging from Paradise. I want to be free, and I want to take you with me. I’ve traveled the world for the past 40 months using my blog as a means to fund my travels. I’ve been blessed to sock away my blogging proceeds in savings too. Really, I want to bring you folks along for the ride. I want you to be free. That’s why I started my new blog and published my first eBook. What is your ultimate goal with what you’re doing online? I’d have to repeat #2 on this one. I’ve no tangible goal other than freeing as many people as humanly possible. I know many folks who want more out of life. They see me living in Fiji, and think, “Why not me?” I’m here to show you how I did it, and how you can do it too. What are the 3 things you think are highly crucial to run a business online? Know why you want to run a business. Tie that reason into being free. Forget money, or fame, or any other material outcome, because focusing on these outcomes kills your creative energies and simply destroys your chances of creating something epic. Build a crystal clear picture of your ideal reader/customer. See the person in detail. Then, do EVERYTHING you do online, from building your blog, to your social media sites, around the idea of serving this person. You’re in business, online, to serve an ideal person. Serve them. Let everybody else go. Clarity counts 10,000% in the online game. Most people fail because they try to chase everybody, to be their customers. The successes start with the ideal customer in mind and caters to this person. Start a blog. A blog is one stop shopping for your ideal customer. You can post videos, reviews, articles, podcasts, eBooks, other products, images and all types of good stuff to your blog. Allow your customers/readers to see you. Run a self-hosted blog. Own your online real estate. What websites you maintain / what businesses you run online? As for businesses, I sell eBooks: Right now, Blogging from Paradise: How to Retire to a Life of Island Hopping through Smart Blogging, is my only eBook but things are moving swiftly with it, as a New York Times Best Selling Author endorsed the eBook. I run a freelance writing business and generate affiliate revenue as well. I also run a blog consulting business. I help bloggers boost their blog traffic and sales by providing in-depth, expert reports to folks who want to grow their business through blogging. Being a non-stop island-hopper and a non-stop blogger, how do you manage your time? I sleep 6 to 8 hours nightly. Anything less, I lose my clarity, my energy drops, and my time-maximizing skills disappear. I do what matters; I write three, 2500 word posts each week. I post in-depth comments on authority blogs. I spend a few minutes on social media each day. I don’t waste time, because I can’t afford to waste time. I exercise for 1 to 2 hours daily. Doing so helps me maintain a high level of energy each day. I meditate for 20 minutes daily. Meditating makes you aware of when you’re wasting time and when you’re spending time wisely. It’s truth serum. I stick to a posting schedule. 2 days before I go live, I write my post. I set aside 1 to 2 hours to churn it out. 1 day before the post goes live, I proof read it, add pictures, and do a bit of SEO – not much – and then I schedule it for 8:05 AM EST, the following day. My posting schedule adds order to my mind, and day, which helps me get to work. As for ideas, I observe my life. We all have 20, 30 or 50 stories to tell, from our lives, each day, but are not watching our lives closely enough. Meditating helps me identify the stories. Also, I tie the stories into blogging tips themed posts, by networking a bunch, and by reading other blogger’s works. They inspire me, with some awesome ideas, then I link these ideas to my travel experiences, and get to writing. Have you ever felt like quitting this online thing? If so, how did you overcome that feeling? Yes, a few times Jane. In those moments, I thought: “What sounds more fun: working as a security officer in Newark, NJ, or living in a home in Savusavu, Fiji (where I am now) with a million dollar view, for 4 months?” Even though I was frustrated as hell, I chose living in Fiji. I made my decision. I’m unemployable, so really, I have no other options in life. I always wanted to be free more than anything, so I didn’t let my fear of uncomfortable moments grow bigger than my desire to be free. What are your views about networking or making connections? What strategies do you use to connect with people? Making friends with the most successful people in your niche is the quickest and easiest way to succeed online. Friends in high places teach you how to grow your business, inspire you, and promote you to their large networks. I post 5, 6 or 7 paragraph comments on authority blogs. I also promote leaders aggressively. Jane, this is about the 26th blog which has featured me in the past 9 weeks. Things have been a blur. Why? I posted my thoughts on authority blogs, writing mini guest posts in the comments section, I provided massive value on my blog and I promoted pros freely. All the effort I put out there came back to me, quickly. Good karma. What are your views about blogging communities? And what do you think about DoSplash, in particular? I love them. I’m learning more about DoSplash these days Jane. Right now, I’m so busy blogging, and doing interviews, and guest posts, and writing for my freelance writing clients, that I focus on Triberr. I may join your wonderful community too, soon. Please provide 5 top blogging tips (out of your experience) to the DoSplash community? 1: Know why you want to blog. Tie that reason into some form of being free. 2: Start a blog with ONE clear reader in mind. Like for my blog, my ideal reader is someone who wants to retire to a life of island hopping through smart blogging. 3: The more you drill down, the better. Many bloggers offer blogging tips, a few more offer how to live the internet lifestyle, but nobody I know of teaches you how to retire to a life of island hopping, through sharing their blogging tips. I inspire you to blog from paradise and based on all the folks who absolutely dig my life, and want to mimic my travels, I started my blog and wrote my eBook. 4: Work on your mindset for at least 60 minutes daily if you’re a newbie blogger, because you need to clear out your limiting beliefs, to seize, digest, and act on good blogging advice. 5: If you’re not having fun, most of the time, you picked the wrong niche. Narrow down your niche but darnit, blog about what you love talking about, offline. That passion and energy will become infectious to like minded-folks. 6: Bonus Tips: Post mega long, helpful comments on top blogs from your niche, to make friends with authority bloggers. These folks will make your blog and business grow like a weed, through their testimonials, and support, and knowledge. Jane, I was a fired security guard 5 years ago. I was depressed and broke as hell. 5 years later, my eBook received an endorsement from Chris Brogan, a NY Times Best Selling Author and Business Coach to Richard Branson, Tony Robbins and Paulo Coelho. I became his friend through commenting on his blog (when comments were open), promoting him, and chatting with him via email in response to his newsletters. Take this tip to the bank, network, network, network. Jane, thanks so much for sharing this opportunity with me. Now before you leave, I urge you to check out Ryan’s e-book if you want to know exactly how Ryan achieved his “Blogging from Paradise” status! What a wonderful interview Jane. Ryan is such an inspirational to us all. I mean what a wonderful lifestyle to live. I know it all starts with hard work but Ryan has laid out for us how he gets it done each day. It is up to us to follow his template. He is very encouraging and lets us all know if he can do it so can we. Thanks for sharing. Nathaniel thanks so much for stopping by and reading. Thanks SO much for sharing this opportunity with me!! The pleasure is all mine Ryan 🙂 Thanks for sharing your views and secrets with us! I have got lot of tips and Inspiration from this interview. Thank you very much. Such an inspiring interview… I am now gonna read Ryan’s ebook ..
Wow thanks Sangeetha appreciate it SOOO much. Hey Ryan, it’s so nice to catch you here . 26th Interview in 9 weeks? That’s phenomenal. I have been really confused about my blog but after reading Ryan speak about clarity and focusing on one core reader again and again, I have been able to clear out my mind. I was in a delima with my own site. I went from making it an internet marketing blog to motivational blog and now it’s a blog on self-publishing. Now, I really love writing about motivation and life. I don’t want to mix things up on my blog and confuse my readers. Hence, I have decided to create a different blog solely focused on motivational articles. Thank you Ryan for teaching me how to start a blog with ONE clear reader in mind. Will see ya around.